The 120-tonne coastal cruiser Kimberley Quest II is not much bigger than one of 18 lifeboats aboard the world's largest passenger ship, the 252,282-tonne Allure of the Seas. But we'd bet that the 25-metre-long KQ2's 18 passengers (maximum) sailing the Kimberley coast of Western Australia would have at least as good a time - in a different way - as the 6,300 or so aboard her 360m-long "big sister" plying the western Caribbean. No crowded lounges, restaurants and swimming pools here, no stage shows, no casinos, no bingo and no long queues to go ashore - no making new friends the first day out then never seeing them again. 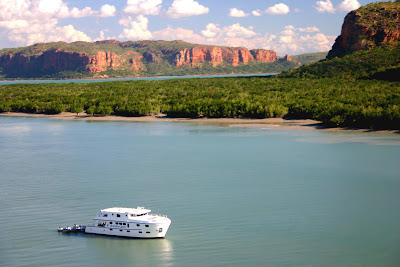 KQ2's voyages between Broome and Wyndham include expeditions by custom-built tenders and on bush tracks into the Kimberley Coast wilderness, a colourful and historic area of craggy rocks, waterfalls, exotic birds and animal life - and ancient rock art.